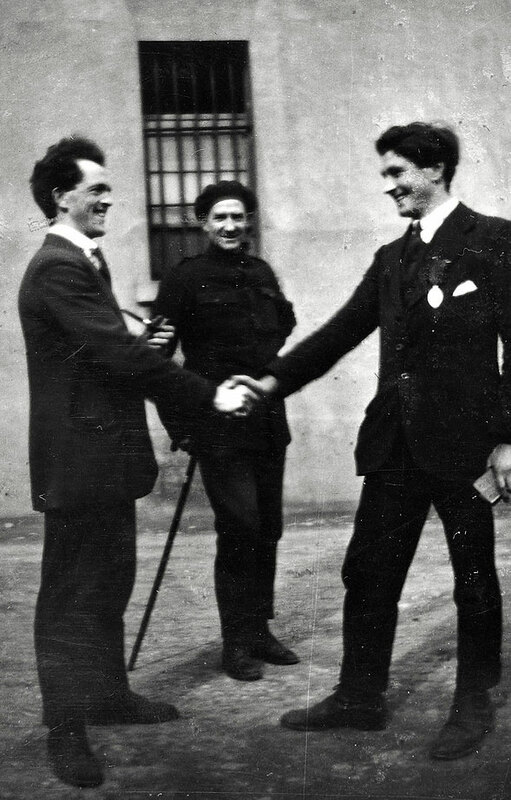 On 14 May 1921, an IRA team led by Paddy Daly and Emmet Dalton mounted an attempt to rescue Sean McEoin from the prison. Disguised as British Officers, they used a captured armoured car to gain access to Mountjoy, but were discovered and had to shoot their way out. One British soldier died in the seizure of the armoured car - Private Albert George Saggers S/11267, "D" Supply Coy. Royal Army Service Corps. The consensus is that one soldier was killed when they highjacked the armoured car, both Vinny Byrne and the press carry the same story. The British do not have appeared to have issued any statement - they were presumably too embarrassed by the episode. The IRA squad overcame the group of British soldiers in an Armoured Car, standing guard over another group of soldiers procuring meat at the Dublin Abbatoir. Once they had taken the Armoured Car, Dalton and Joe Leonard impersonated British army officers (wearing Dalton's uniforms from his days as a soldier during World War I) and using forged documents giving them perission to "transfer" MacEoin to Dublin Castle. They got into Mountjoy, but were discovered before they could free MacEoin and had to shoot their way out. They then abandoned the armoured car , removed the Hotchkiss machine guns and setting fire to the car. The armoured car with the same crew returned on its second journey and behaved as Charlie had predicted, the last British Tommy got out and locked it and went for a stroll. Volunteers wearing Corporation uniform caps and waiting about the Abattoir picked up the pre-arranged signal, closed in and held up the Tommies, shooting some who resisted, secured the keys of the car, which became our property a peerless, twin-turret, whippet. Pat McCrea had never seen the inside of a car like this in his life, but in his own quiet way used his native wits, stepped on the gas and accompanied by Tom Keogh, Paddy McCaffery and Bill Stepleton machine-gunners proceeded down the North Circular Road and picked up Emmet Dalton and myself, already dressed and armed as two British officers, McCrea drove to Mountjoy Prison and seeing the narrow drive-way wondered how the devil he would get the car out and away. On approaching the main gate Emmet Dalton waved an official-looking paper at the lock-out warder the gate opened wide and shut-to with a clang after us. Two more iron gates were opened for us but McCrea used his long head, driving the car in one long sweep around by the main entrance and back through the two iron gates he had just entered, carelessly jamming both open and so leaving the main gate only to be negotiated. it was now or never we forced the door open good-byes were said quickly we left the building with all haste. McKeon was not in the Governor's office as we had arrived a half-hour too late for that appointment. The main gate party, headed by Aine Malone with her dummy parcel, had succeeded in rushing the wicket gate after a good scuffle, and when the main gate was forcibly opened by our Volunteers for us they drew the roof-top sentry's fire, which wounded one of our men, raising the general alarm, but the ever alert Tom Keogh shot this sentry dead from the court-yard, his rifle falling to the pavement. On Dalton and myself rushing through the main door I spotted the rifle, picking it up I ordered the British military back, and on their refusal to obey knelt down and threatened to fire on them they seeing an officer kneeling in the firing position, broke and retired to their quarters, but the Police advanced from another position. It was time to jump on the back of the whippet and go, taking the rifle with us. We shouted to Pat to let her rip, and Pat McCrea drove down that drive and on to the North Circular Road at a speed that was very satisfactory, seeing that we were exposed to a rather heavy fire from, the Prison. 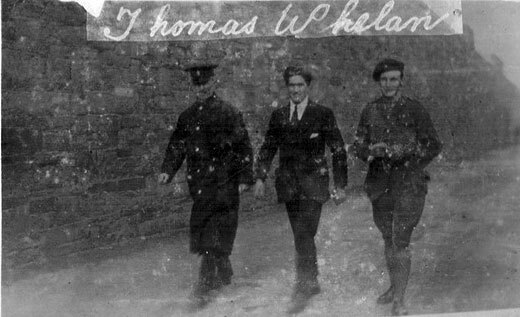 Emmet Dalton and myself had no plan of action agreed on, but there was a taxi at our disposal near the end of the street which we transferred into, and not knowing what the British reaction would be, decided to drive to Howth to consider what our next move should be, recollecting that we were two English officers with no home to go to. In May, 1921, received a despatch from Michael Collins, informing me that a new attempt would be made to rescue me from Mounjoy prison. The despatch instructed me to contact Warder Breslin. Later that evening, I received information and instructions from Collins, also in despatch. These were to the effect that an armoured car, manned by Volunteers would enter Mountjoy prison at an time between ten and twelve o'clock on the following morning, and that I must take such steps as were necessary to be in the Governor's office, and remain there for that time. When I came in from exercise that same evening, I made contact with Breslin who informed me that everything was ready for action the next roornir1g. On return to my cell, I Immediately sent for the Deputy Governor, Mr. Meehan, and made a violent attack upon the conduct of (a) the warders, (b) the Auxiliaries, and c) the Black and Tans, who were in charge of C (I) Wing and were our gaolers. In accordance with the Rules, I demanded a immediate interview with the Governor, and succeeded in arranging the interview for the following morning. Everything was working according to plan, and I arrived in the Governor's office, escorted by an Auxiliary officer and a warder. I succeeded in remaining in the office with the Governor, Charlie Munroe, until about 11.30, when I informed Munroe that I had further complaints on behalf of many of the prisoners, and that I would return to my cell and prepare notes for use next morning. This was simply a makeshift, as I did not know what had happened. Going out to eexercise after lunch, Breslin contacted me again, and informed me that the Car had not been taken that day, but that the attempt would be made on the following day, and that the same plan must work. I then sent a despatch to Collins, informing him that I could be in the Governor's office on the following morning, and that I would be accompanied by an Auxiliary officer with a revolver, but that, when our men would arrive, I thought I could handle him. As arranged on Thursday morning, I was once more In the Governor's office, and remained there for about the same time, with the same result; and, on going out to exercise, I received a repetition of the same message from Breslin. On the third morning, the interview was again arranged with the Governor for 10 a.m., but, in the meantime, something had occurred which we had not foreseen. The members of the Auxiliary and Black and Tan guard, who were in charge of the Wing, were being relieved, and a new body of Auxiliaries and Tans were taking over the duty. The officer commanding the new party insisted that every prisoner in C CI) Wing should be locked in his cell. This was done. Then the new party, accompanied by the officer commanding the old party, came and saw each prisoner. This was for the purpose of identification. Each prisoner was carefully scrutinised, and notes taken of him by each member of the guard, so that each one would know and recognise each one of the prisoners who was being handed over, for the first time, into their custody. It was then believed by the authorities that the warders could not be trusted, and that prisoners might be enabled to exchange cells, so that they would have wrong names and wrong cells. While this was going on, I protested and claimed my interview with the Governor, which I had arranged. Mr. Meehan, the Deputy Governor, was present, and explained to the Commander that I had an interview arranged with the The Auxiliary officer replied that my interview with the Governor would be time enough, that his orders took precedence. While this inspection was taking place, the armoured car arrived into Mountjoy, and the first indication I had of its presence was the firing of shots. The Auxiliaries manned the inner gate of C (I) Wing, and, in a short time afterwards, they returned, and opened my cell. They were very excited, and proceeded to search every corner of the cell and my person. While this was proceeding, Breslin came into the cell, and said to the Auxiliaries, "We are all safe! ", at the same time, giving me the "glad-eye". From that wink, I Realised that the car had come in and gone out, and that those with it were all safe. I bluffed the Auxiliaries a bit, by saying, "When you meet the armoured car down-town, you will have a very hot time, if I get much more abuse!" I wished hem luck in their efforts, feeling satisfied that they could not have secured any information upon the line ofcommunication, which was a very simple and very old method. That is another story. When the excitement had died down, I was blandly informed that the Governor was now ready to receive me, not in his usual office but in a cell at the end of C (I) Wing, and all interviews with the Governor thereafter, while I was a prisoner in Mountjoy, were in this cell. 1921 Nov 11. P Coy were guarding Mountjoy Prison when there was an IRA escape of Wing. The seven who escaped were Leo Fitzgerald, Liam Troy, Gerry Davis, Paddy Rigney, Paddy O'Brien, Tom Keegan and Christy Smith. 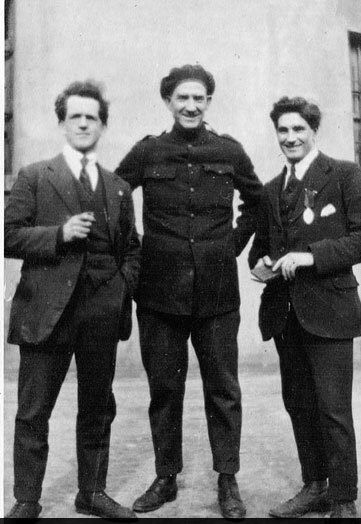 WS1361 ".... Paddy Rigney approached me and three other prisoners - O'Brien, Smith and Keegan - and we agreed to chance it. Fitzgerald said that only a limited number could try it ......We now started making arrangements to escape. We were allowed visitors at the time, and on those visits it was arranged that a few guns would be smuggled into us by women. The women called to visit us and, as there was only a warder on duty with us during visits, we succeeded in getting in a few guns. I got one gun on a visit and Fitzgerald hid this for me. The Auxiliary Company who were guarding the prison at the time wore "Tam-o-Shanter" caps with a badge made of cloth, half green and half yellow. The women made five of these caps for us..... On the night of 11th November 1921, the Auxiliaries were pretty well all drunk, as they were celebrating Armistice Day, and Fitzgerald sent word to us that this was our chance. "